Amazon has unveiled the Echo Show, an Alexa-enabled speaker 7 Creative Uses for Amazon Echo and Alexa 7 Creative Uses for Amazon Echo and Alexa You’ve seen the ads starring Alec Baldwin, but you're still not sure what Amazon Echo does or whether you need one in your home. We’re about to find out. Read More with a touchscreen built into it. If that doesn’t sound particularly compelling to you then you’re not alone, as reactions to the Echo Show have been somewhat negative. Especially because it looks like it belongs in the 1980s. Putting its questionable aesthetics aside, the Echo Show does increase the number of things you can do with Alexa. The touchscreen means Alexa can now show you things as well letting you hear them. Which brings it into competition with your phone, tablet, and smart television. The Echo Show is, at its heart, a regular Echo speaker with a 7-inch touchscreen attached. To accommodate the screen Amazon has switched from the cool cylindrical design of the Echo to a boxy, retro design. Everyone will have an opinion, but I personally don’t like how it looks. The addition of the screen means the Echo Show has a host of new skills at its disposal. You can use it to make video calls, send text messages, watch YouTube videos and news broadcasts, check the weather forecast, display photos, and see lyrics scrolling past as you listen to music. Like the Echo Look The Amazon Echo Look Gives You Fashion Advice The Amazon Echo Look Gives You Fashion Advice The Amazon Echo Look is a hands-free camera designed to dole out fashion advice to those who need it. Useful? Possibly. Niche? Probably. Narcissistic? Definitely. 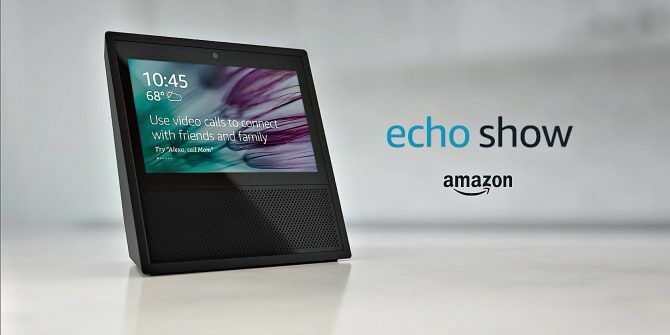 Read More , the Echo Show boasts a front-facing camera. This enables the aforementioned video calls, and a new “Drop In” feature connecting you to friends and family. You can also connect to smart home devices, looking in on your sleeping baby or spying on your front door. The Amazon Echo Show is available for pre-order in the U.S. (and only the U.S.) right now. It comes in black or white, and is currently priced at $229.99. The first devices will start shipping to the earliest of early adopters on June 28, 2017. Unlike the previous Echo speakers Amazon Echo vs. Dot vs. Tap: What Are the Key Differences? Amazon Echo vs. Dot vs. Tap: What Are the Key Differences? One common complaint against Amazon Echo was that it had too many features and cost too much. Amazon's response to that? Releasing two variations with smaller price tags: the Tap and the Echo Dot. Read More , which are instantly appealing, the usefulness of the Echo Show needs explaining. Which isn’t a good starting point for a product aimed at mainstream consumers. Only time will tell whether the average Amazon shopper will be interested. Do you currently own an Echo device? Do you have any interest in the Echo Show? Can you imagine scenarios in which you’d make use of the touchscreen? Is the boxy design a turnoff? Or do you appreciate the retro styling? Please let us know in the comments below! Explore more about: Alexa, Amazon, Amazon Echo, Speakers, Touchscreen. I had an Echo on the day of it's release. I had to explain to pretty much everyone that came over what it way and "why" it was. Now pretty much all of them have one are talking about it. I do know people that jumped on the "bandwagon" and bought one but have not bothered to unbox it, which I think once they do and start using it, they will see. As for the "show", I have pre-ordered it. Knowing all Alexa is capable of now, the addition of video opens up so many fun options. While our original echo sits in living area, I see this as a master bedroom device. Basically used as a super advanced alarm clock and mini-entertainment center. As for the design, sure it could be "cooler", but I have never looked at my Echo and went wow, that item i use 12 hours a day could sure be "prettier". Function first! How is this any different than getting a $79 Amazon tablet with Alexa software on it? I have Echo Dots all over my home. I like music on demand. I like being able to tell Alexa to send videos to Plex. I wish that it could control multiple devices and I especially wish that it had a skill to let me start Youtube or make my FireTVs do something, both things Google Home can manage. This thing is potentially interesting as a video phone or as a monitor for kids, elderly or sick people. That's not what Amazon is talking about right now, but that's an obvious main use. I don't think anyone needs a $200 alarm clock with a screen, but if it integrates some of the Echo Look stuff in it, maybe there's a use for it there as well. Amazon seems to do a great job of making useful, reasonably priced devices that do just enough to win in the marketplace. That's probably the case here. This might be a good compromise device for a technically inept grandma who wants to video chat or something. I love the functionality of an always on device like the Alexa products. Now that they've added video and ability to make calls, it's a much more powerful device than an iPad is because it is designed to be at a single fixed location and it's always ready. I've been waiting for a device like this so that I can call my kids on videophone without guessing if the iPad is where people can hear a ring or if the battery is dead. This will not get misplaced, it is always on, and it's already easy enough to use for even little kids. Sign me up!